Can Bad Habits Affect Digestion? Smooth digestion is important for a sense of overall well-being. Bad digestion can lead to trapped air in the body, leading to energy being diverted away from other systems, and the digestive system being unable to extract the right amounts of nutrients from the food. All of these consequences can lead to health problems or simply discomfort. There are many reasons for digestion, and some claim that bad habits can lead to digestion that is less than ideal. Read on to discover if bad habits can affect digestion. 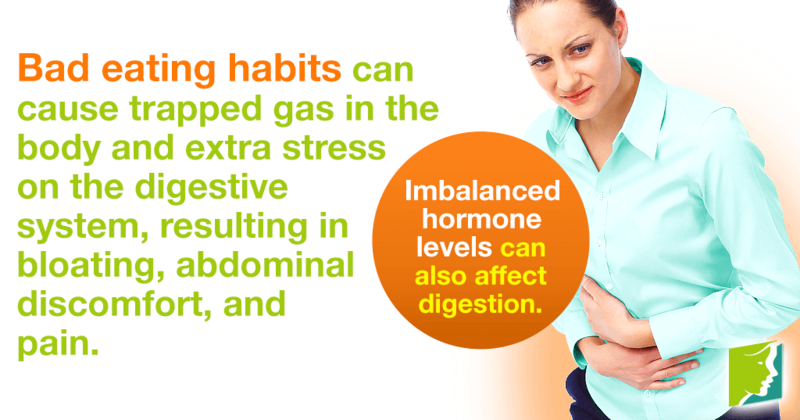 Eating habits can cause trapped gas in the body and extra stress on the digestive system. The result can be bloating, abdominal discomfort, and pain. Bad eating habits include eating too fast, eating too much food in one sitting, and not chewing food properly. The are different reasons why these can cause digestive problems; eating too fast can lead to the swallowing of air, which can then get trapped in the digestive tract and make it difficult for food to pass through. In addition, it can often lead to eating too much, as the brain does not register it is full until large amounts of food have been eaten. To overload the stomach means there is a large amount of food having to be digested, and this can lead to increased stress on the digestive system. A sedentary lifestyle is also a bad habit that can affect digestion. Without exercise, there is less blood flow going to the digestive system, and so it is not functioning as optimally as it could do. By spending too much time sitting, the food is also not being encouraged to pass through the digestive tract, and this can lead to bad digestion. Although bad habits do have some effect on bad digestion, they are not the only cause. Sometimes, digestive problems can be caused by an intolerance to a certain food, so do not always assume that a change in habits is a foolproof way to improve digestion. Sometimes, it is worth working out what is causing the bad reactions and avoiding the triggers. In addition, imbalanced hormone levels can sometimes be to blame, as they normally have an effect on all systems in the body. There is no doubt that bad habits do affect digestion, but they are not the only cause. Much of the time, a multifaceted approach is needed, and this can include healthy lifestyle choices, medication, and avoidance of certain factors. Your digestive health is directly impacted by the foods you eat and your lifestyle. By taking steps to improve your digestive health, your digestive system will function more efficiently, but if digestive problems are truly bad, it is worth seeking medical advice. Read about top home remedies for digestive problems. Cramps, bloating, heartburn, you've had it all. During perimenopause, women experience digestive problems. Find out how you can relieve your problems. Menopausal digestive problems can greatly impact your daily life. Learn more about the causes here.